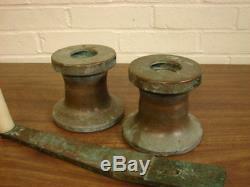 South Coast vintage bronze winch set. Units measure 4-1/2" high x 5-1/4" base diameter x 3 drum diameter. Units have been bench tested, cleaned internally and work as intended. Units show typical signs of wear from use and weather externally. Price is for set of two(2) winches with handle, but will sell separately (send message). The item "SOUTH COAST VINTAGE BRONZE WINCH SET WithHANDLE" is in sale since Monday, April 2, 2018. 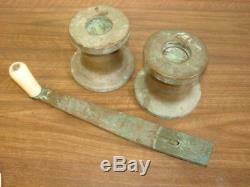 This item is in the category "eBay Motors\Parts & Accessories\Boat Parts\Sailing Hardware & Gear\Sailing Winches". The seller is "salvagemarinenet" and is located in North Pembroke, Massachusetts.